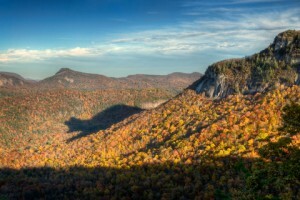 This is the time of year that Highlands NC welcomes the giant bear shadow that appears each year during the fall. This is a beautiful time of year in our area and the giant shadow that appears late in the day is one which adds a little extra magic. Whiteside Mountain provides the canvas for the bear to appear as the sun starts setting. The dramatic bear shadow appears between 5:30 and 6 pm from mid October through early November. This magnificent natural appearance is the perfect end of the day for anyone who has enjoyed a day of leaf peeping and certainly adds to the beauty of the Highlands area. The best place to view the big bear shadow is right off Highway 64 in a place called Rhodes Big View Overlook. Contact me, Lynn Kimball, today to learn more about living in our unique area. I welcome the opportunity to serve as your guide to Highlands real estate, updating you on current market conditions while getting you started on your home search. Let my knowledge and experience help you enjoy a lifetime of experiences in Highlands NC. Click here to read “It’s a Zoo(m) Out There!” from The Laurel Magazine.